This article is about a lesser flow of water. For other uses, see Tributary (disambiguation). In the United States, where tributaries sometimes have the same name as the river into which they feed, they are called forks. These are typically designated by compass direction. For example, the American River receives flow from its North, Middle, and South forks. The Chicago River's North Branch has the East, West, and Middle Fork; the South Branch has its South Fork, and used to have a West Fork as well (now filled in). Forks are sometimes designated as right or left. Here, the "handedness" is from the point of view of an observer facing upstream. For instance, Steer Creek has a left tributary which is called Right Fork Steer Creek. Tributaries are sometimes listed starting with those nearest to the source of the river and ending with those nearest to the mouth of the river. The Strahler Stream Order examines the arrangement of tributaries in a hierarchy of first, second, third, and higher orders, with the first-order tributary being typically the least in size. For example, a second-order tributary would be the result of two or more first-order tributaries combining to form the second-order tributary. Another method is to list tributaries from mouth to source, in the form of a tree structure, stored as a tree data structure. The water basin of the Wabash River; the other rivers (not including the Ohio River) are tributaries of the Wabash River. The Vermillion River (and its forks) is a highlighted example of a tributary of the Wabash River. The Wabash River is also a tributary of the Ohio River. The basin of the mighty Amazon River is a system made up of many tributary streams. 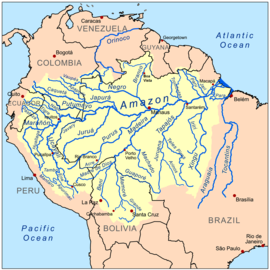 The streams shown on the map besides the Amazon are tributaries of the Amazon. The Amazon is not a tributary of any other rivers because it ends in the Atlantic Ocean. The Liao River is a much simpler example of a river basin with tributaries. The main tributaries noted on this map are the Hun River, Taizi River, Dongliao River, Xinkai River, Xiliao River, Xar Moron River and the Laoha River. The Xiliao River has the tributaries on the map the Xar Moron and Laoha Rivers. Jialing River tributaries (which itself is a tributary of the Yangtze River). Huai River tributaries (which itself is a tributary of the Yangtze River). ^ "tributary". PhysicalGeography.net, Michael Pidwirny & Scott Jones, 2009. Viewed 17 September 2012. ^ "affluent". The American Heritage Dictionary of the English Language, Fourth Edition. Houghton Mifflin Company, 2004. Viewed 30 Sep. 2008. ^ "Definition of TRIBUTARY". Merriam-Webster. ^ "opposite to a tributary". PhysicalGeography.net, Michael Pidwirny & Scott Jones, 2009. Viewed 17 September 2012. ^ a b Bisson, Peter and Wondzell, Steven. “Olympic Experimental State Forest Synthesis of Riparian Research and Monitoring”, United States Forest Service, p. 15 (December 1, 2009). Wikimedia Commons has media related to Tributaries. Look up tributary, confluent, or affluent in Wiktionary, the free dictionary.